2019 Civic LX CVT FWD 4-Door Sedan. MSRP: $21,170. Model Code: FC2F6KEW. Plus tax and fees. 36 month closed end lease. 36,000 miles/year. $0.15 per mile overage. To qualified buyers through AHFC. Offer valid through 4/30/2019. 2019 Fit LX CVT FWD Hatchback. MSRP: $17,885. Model Code: GK5H4KEW. Plus tax and fees. 36 month closed end lease. 36,000 miles/year. $0.15 per mile overage. To qualified buyers through AHFC. Offer valid through 4/30/2019. 2019 Civic Hatchback EX CVT FWD. MSRP: $24,645. Model Code: FK7H6KJW. Plus tax and fees. 36 month closed end lease. 36,000 miles/year. $0.15 per mile overage. To qualified buyers through AHFC. Offer valid through 4/30/2019. 2019 Civic Sport CVT FWD 4-Door Sedan. MSRP: $22,870. Model Code: FC2F8KEW. Plus tax and fees. 36 month closed end lease. 36,000 miles/year. $0.15 per mile overage. To qualified buyers through AHFC. Offer valid through 4/30/2019. 2019 Accord LX CVT FWD 4 Door Sedan. MSRP: $24,615. Model Code: CV1F1KEW. Plus tax and fees. 36 month closed end lease. 36,000 miles/year. $0.15 per mile overage. To qualified buyers through AHFC. Offer valid through 4/30/2019. 2019 HR-V LX FWD. MSRP: $21,565. Model Code: RU5H3KEW. Plus tax and fees. 36 month closed end lease. 36,000 miles/year. $0.15 per mile overage. To qualified buyers through AHFC. Offer valid through 4/30/2019. 2019 CR-V LX FWD SUV. MSRP: $25,395. Model Code: RW5H3KEW. Plus tax and fees. 36 month closed end lease. 36,000 miles/year. $0.15 per mile overage. To qualified buyers through AHFC. Offer valid through 4/30/2019. 2019 Insight LX CVT FWD Sedan. MSRP: $23,850. Model Code: ZE4F1KEW. Plus tax and fees. 36 month closed end lease. 36,000 miles/year. $0.15 per mile overage. To qualified buyers through AHFC. Offer valid through 4/30/2019. 2019 Pilot LX FWD SUV. MSRP: $32,495. Model Code: YF5H1KEW. Plus tax and fees. 36 month closed end lease. 36,000 miles/year. $0.15 per mile overage. To qualified buyers through AHFC. Offer valid through 4/30/2019. 2019 Odyssey EX Passenger Van. MSRP: $35,205. Model Code: RL6H5KEXW. Plus tax and fees. 36 month closed end lease. 36,000 miles/year. $0.15 per mile overage. To qualified buyers through AHFC. Offer valid through 4/30/2019. *Only one $500 Honda Military Appreciation offer per vehicle. $500 must be used for Cap Cost Reduction or down payment. For well-qualified clients, subject to approval by HFS. Offer cannot be combined with Zero Due at Signing Lease Program. 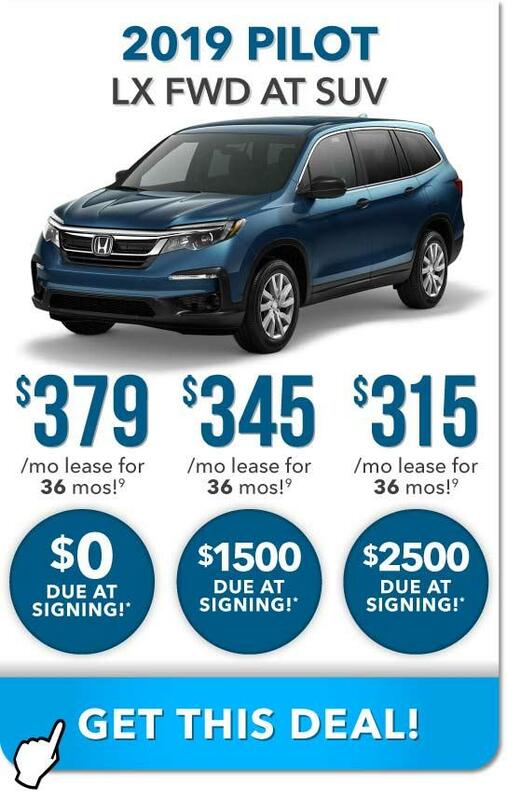 Offer not valid on Honda Certified Used Car or used vehicles. Offer valid through March 31, 2020 and may be terminated at any time. **Only one 500 Honda College Graduate Bonus per vehicle. $500 must be used for Cap Cost Reduction or down payment. For well-qualified clients, subject to approval by HFS. Offer cannot be combined with Zero Due at Signing Lease Program. 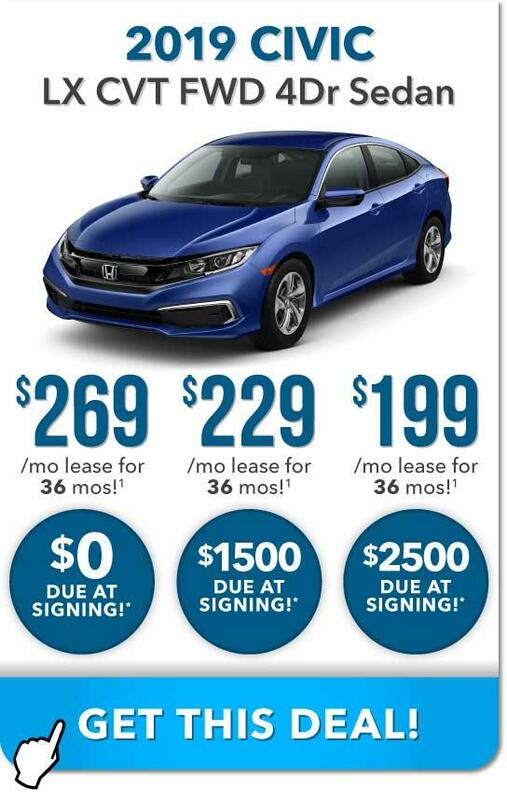 Offer not valid on Honda Certified Used Car or used vehicles. Offer valid through March 31, 2020 and may be terminated at any time.